The Campaign for Better Transport is supporting Greenpeace and other organisations and joining the Rally for Rail on Saturday the 29th October in downtown Auckland. Details to be announced, but keep the date free to support the continued investment in passenger rail in Auckland. 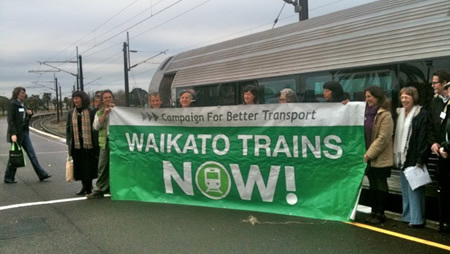 Submissions have now finished, but followers of our Waikato Trains Now! campaign might find this letter we sent to Cr Norm Barker at Environment Waikato a useful summary of the current positions. Environment Waikato are currently deliberating over whether to include Waikato rail in their Annual Plan.